Access 2010 comes with a bunch of cool web database templates, some with instructional videos for using and configuring them. Before you create your own web database from scratch, you may want to check these templates out for ideas. Who knows? You might find one that meets your needs or just requires minor tweaking. After you have your web database built — complete with forms, queries, and so on — publishing it to your SharePoint site as a subsite requires only a few mouse clicks. Click File from the menu to go to the Backstage view of the application. 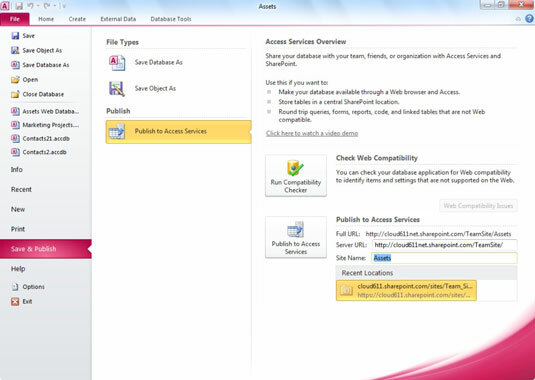 In the Backstage view, select the Publish to Access Services option on the middle pane. On the right panel, enter the URL for your SharePoint site where you want the subsite for the database to be created. Click the Publish to Access Services icon to the left of the URL boxes. Depending on how your account is set up, you may or may not need to log in with your Office 365 credentials. If there are no errors, you get the Publish Succeeded dialog box with a link to your new site. Your newly created site is now connected to the Access database running from your desktop application. Changes you make to your database from the desktop application will be reflected at the SharePoint site, and the changes you make at the SharePoint site appear in your database.